A Penitent Blogger: Are we afraid? "If we let Christ enter fully into our lives, if we open ourselves totally to him, are we not afraid that He might take something away from us? "Are we not perhaps afraid to give up something significant, something unique, something that makes life so beautiful? Do we not then risk ending up diminished and deprived of our freedom? "No! If we let Christ into our lives, we lose nothing, nothing, absolutely nothing of what makes life free, beautiful and great. "No! Only in this friendship are the doors of life opened wide. Only in this friendship is the great potential of human existence truly revealed. Only in this friendship do we experience beauty and liberation. "And so, today, with great strength and great conviction, on the basis of long personal experience of life, I say to you, dear young people: Do not be afraid of Christ! "He takes nothing away, and he gives you everything. When we give ourselves to him, we receive a hundredfold in return. "Yes, open, open wide the doors to Christ – and you will find true life." 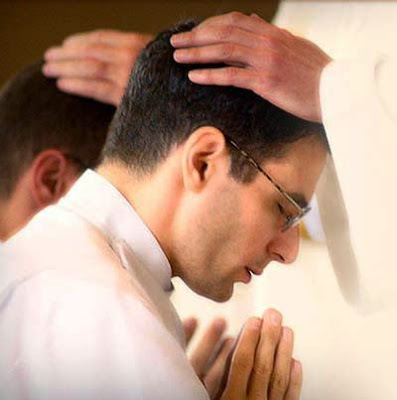 Happy National Vocations Awareness Week!